During the first month or so of employment, my most frequently assigned task was to take the subway from Queens to the Manhattan offices of NBC Productions, in Rockefeller Center (30 Rock). Usually I would arrive at the reception desk, be handed an envelope, and then be sent right back to Queens. On one of my walks underneath 30 Rock to the subway, I discovered the only place in New York City where you could buy some rare and coveted coffee beans from Seattle, where I’d lived in the summer after my junior year of college. Starbucks. They sent me for these envelopes because it was cheaper than using a courier, but I noticed right away that saving money was not a priority here. Sometimes, they would send me on errands in a car service because I had to make multiple stops to acquire things. These trips could easily have been made on trains, buses and foot, and I was young enough to carry armloads if I had to — that was the point of hiring people like me as Production Assistants, of course. Once, I was assigned to go get something at a place called DeWitt’s, but the driver and I couldn’t find it. After well over an hour of driving around Queens looking for DeWitt’s, running up the fare, passing the correct address numerous times and not understanding why DeWitt’s wasn’t there, I deduced the problem: the place was there, and it wasn’t called DeWitt’s. It was called The Wiz — actually, Nobody Beats The Wiz, back then a prominent and popular chain of electronics stores in the northeast. It has been out of business for thirteen years. By August, most of the crew was in place, and I was assigned to the writers’ offices. Not as a Writer’s Assistant, because three of those were also hired, but as a Production Assistant in the writers’ offices. The writers worked in previously established teams (at least one of the teams lasted for decades), except for one who worked solo, wrote the best script anyone saw for the series, and had the lowest title among the Eligible Dentist writers: “Writer.” The others were all “Producers” of some variety or other. One of them, the “Co-Executive Producer,” as I recall, was a woman named Pat Nardo, who had made her name as head writer for The Mary Tyler Moore Show and Rhoda in the seventies. A character in Taxi, Elaine Nardo, is named after her. Another writer on the show was Lorin Dreyfuss, who is Richard Dreyfuss’s brother. It became clear pretty quickly that certainly Nardo and probably Dreyfuss were brought in as Mark II reinforcements for Seltzer, which really meant potential replacements. I understood that the studio wasn’t especially happy with Seltzer, who was Wilder’s handpicked choice to run the show. The presence of these two seasoned Co-Executive Producers was essentially a threat to Seltzer’s job, or at least it created conditions of prevailing conflict and tension. One of my crucial tasks in the writers’ office was to make sure the kitchen was always stocked with Grape-Nuts, per Pat Nardo’s requirements. I don’t remember much about Pat Nardo except that she wasn’t nice to anyone, but in a way that struck me as the deliberate and self-protectively necessary practice of a woman working in the deeply misogynist entertainment business — a woman, moreover, who had made her name writing scripts for television shows about independent female heroines, which was a groundbreaking endeavor in the early seventies. Her Grape-Nuts demand seemed more about the demand itself than about the Grape-Nuts, since of course she never ate them, and I felt an odd sympathy for her: a Co-Executive Producer was entitled, even required, to make demands, but she demanded nothing more, or more flavorful, than Grape-Nuts. She never ate them. I wound up eating them myself, box after box, and then going to the Pathmark to replace them. A couple of company cars were leased, and I sometimes had to drive one, terrified, over the 59th Street Bridge into Manhattan, honking madly the whole time. Once I had to drive the company car all the way to Canal Street just to pick up a single box of nails approximately the size of a Rolodex. I wondered why I hadn’t been told to take the subway, which would have been faster and more efficient. But when I picked up the box it was almost impossibly, metaphysically heavy, as if in defiance of natural laws — something out of a Gene Wilder movie. I lugged it to the passenger seat, drove it all the way back to the studio and delivered it to the technical director. He was a nice guy, of the classic theater tech ilk: long ponytail, overalls, chain smoker. He seemed to be perpetually stoned. He appeared to be engaged in building the beginnings of an actual set. I had the sense that things were happening, that something like a television show would occur soon. But on a daily basis I still had, and sought, little to do. I got into the habit, when I was sent into the city on errands to 30 Rock or wherever, of knocking off and meeting my girlfriend for lunch, or popping into record stores, or wandering around. No one seemed to notice that my absences were sometimes twice as long as they should have been. These were the days before cellphones, so they gave me a pager (“your leash,” the Line Producer said, mimicking a villainous grin), but they hardly ever paged me on it. When they did, I’d find a phone, call them, and be instructed to go pick up another thing or two, which would allow me to tack extra time onto my delinquencies. The show was limited to a half-hour in the end, but Seltzer won another battle that had expensive spoils: it was to be shot, as he wanted, on film rather than video. I gathered that this victory on his part resulted in more delays as a larger crew and more sophisticated equipment were assembled, because we had seemed to be right on the verge of commencing production but production did not commence. I also sensed a fair amount of grousing from the understaff about the decision to shoot on film, as if it was an overmuch and unnecessary application to what should presumably have been, in their eyes, a simple, shot-reverse-shot video sitcom that just wanted to get laid. Many years later, Seltzer speculated that the show might simply have been ahead of its time; that the television industry was not yet ready to accommodate big-budget, fantastical hour-long comedy-dramas, as it is now. Meanwhile, the writers were busy writing in their teams, Seltzer was busy writing on his own, and there was plenty of activity, but we seldom saw any practical results, i.e. scripts. The mood grew palpably negative, the discord between Seltzer and his writers took on a personal flavor. I saw Seltzer’s stepdaughter for dinner and told her, stupidly, that the writers hated her stepfather and her stepfather hated the writers. She, of course, told Seltzer, and soon I was summoned into Seltzer’s office where, rather than give me the business, he instead plied me for any information I had about the nature of the writers’ disaffection for him. I don’t recall how I described her in my script, or if she even ended up in it. I wrote it on a computer no one ever used, in full view of everyone in the open-plan office, while I was on the clock during afternoons when there was nothing to do, which was still most of them. I showed my script to Seltzer. He was blandly encouraging but said (correctly) that the central premise was flawed, and he told me to work on another one. Before I could do that, though, it became clear that there would be an actual script soon, and a large photocopier appeared in a room off the writers’ area that I hadn’t known existed. I was introduced to this photocopier as if it was a large, unruly, chronically diseased and incontinent pet that would now be my responsibility to care for and raise, with perhaps serious consequences if I was unsuccessful. It was my job to make the copies — this was my big role on the show, the work for which they’d been reserving me all along (or the only work I’d shown myself worthy of doing). There was a complicated system of different colors of paper to denote different days of the week. This was part of a larger script-writing system, very deeply entrenched, I gathered, whereby a script would be written; copied on a certain color of paper; edited the next day in writing sessions with the entire team of writers plus Seltzer and a “punch-up guy,” expensively imported from Hollywood; retyped in proper format by the Writers’ Assistants; and then the new version copied again on a different color paper. Some sort of stamp or watermark was involved, to safeguard against theft or leakage. It was all very complicated, labor-intensive, secretive; I assume that the internet and software and other advancements since the early nineties have ended the use of this creaking, ungainly system, which was dependent on that most notoriously unreliable of machines, the photocopier, and on a young, bored, petulant, untrustworthy PA, me, running it. The writers’ assistants, three young women who were all very nice, like older sisters, would work well into the night while I slept in an employee break room down the hall. I had to rest because they would rouse me after midnight and hand me a printout of the new script; then I would make dozens of copies of it on that day’s colored paper until four or five in the morning, or even until daybreak. Once I was sent home in a car service shortly before sunrise, the limo gliding silently across empty Manhattan cross-streets. I slept until about noon and then went back to the studio to hang around and do nothing. Instead I was taken aside and dressed down by the Producer — not by the Line Producer or by any writer, and certainly not by David Seltzer, but by a woman who seemed more or less like the second-in-command behind the Line Producer. She was, I had to come to accept, my direct supervisor, yet another functionary put in place between me and David Seltzer, but I seldom recall doing anything actually for her. She just seemed like a point person who funneled work into and out of the hands of people whose job it was to be below her, like me. She berated me in a hallway for sauntering in at that late hour. She then added scoldings for everything about my work and my approach to it. She said I had to “stop thinking of this as a regular job!” She told me that when I was sent into the city on errands, I had to come right back when they were done. She’d known all along that I was playing hooky every time I went into Manhattan. Twice chastened, I improved. Every day I would check the Grape-Nuts supply, efficiently and cheerfully run any errands that were assigned to me and volunteer for any others that might need running. If I was sent into the city, I came right back. At night, I fell asleep in the employee break room. The Writers’ Assistants would wake me and I would make the copies. I would check to make sure each script was complete, pages smooth and in order, no blanks having stuck to others. I would go home at three, four, five-forty-five in the morning. (Perhaps I slept through at Kaufman Studios once or twice. I don’t really remember.) Then I would be up and back at the studio, bleary but ready to work, at nine or nine-thirty. I stopped thinking of it as a regular job, as instructed. I gave myself to it. What became of that first week’s script? I don’t recall. I do recall there was more scripting. More sessions, more copying, more colored paper, more drawing board. More NBC demanding changes. It all seemed to reach a head when Pat Nardo, I think (with or without Lorin Dreyfuss, I can’t remember), produced a script that culminated in some totally outlandish stunt or shaggy-dog nonsense: something like explosions, or screaming monkeys, or Wallace Shawn and Gene Wilder in Kiss costumes. I really don’t remember, except that I did happen to read the conclusion of the script and think not only that something that gotten very, very far out of hand, but that this was Nardo’s way of issuing a written protest against Seltzer’s rule and against Eligible Dentist as a whole. Someone at the end of her tether. I also quite clearly remember the word Seltzer used to describe Nardo’s offending script: “Unconscionable.” I Don’t know if there was triage afterwards, intervention by NBC executives, or any other official response to Nardo’s (and Dreyfuss’s) apparent act of mutiny. Eligible Dentist was hemorrhaging money. But then a workable script suddenly materialized, surprising and delighting everyone like the glinting gold ticket in a Willy Wonka candy bar. I was quickly put back to work copying, now with more urgency than ever. We were going to make a pilot. The new pilot. The show was going to happen. Costumes, lights, props, dolly grips. A frenzy of activity. A treadmill was ordered for installation in Carol Kane’s dressing room, at her command: a glimpse one day of Carol Kane herself, tiny and elfin, slipping into her dressing room to inspect the treadmill, which took up most of it. Then, not long after, we were told that Gene Wilder himself would be coming to Kaufman Studios. Suddenly, all of the rancor, ill will, and cracked cynicism of Eligible Dentist healed. Everyone adopted the very best good behavior. Not the good behavior of soldiers expecting a General, or of Hollywood drones cowering in anticipation of a tyrannical producer or a demanding, mercurial, tantrum-throwing celebrity. No, this was a different kind of good behavior — true good behavior: generous, warm, sincere, a clearing away of all of the badness, a straightening of social posture and loosening of the restraints of hope. A sort of radiant but active quiet overtook the studios. It was as if we had all been reminded that a few of the old, delicate, threatened things were in fact still quite alive, that these things had the power to light our way, and that without them we lived a bloodless, mean little life, the life to which television doomed us but which its careerists had come to accept as tolerable. If we could not lift ourselves out of it for Gene Wilder, we would not only be denigrating him and his lithe, magical, prismatic, demure kindliness, cutting off his dancing at the knees, but also offending the tragedy of Gilda, who was really the reason we were all here in the first place. On the appointed day, the Line Producer, who always wore t-shirts and jeans, put on a shirt with buttons, pressed trousers, and a sweater draped over his back with the arms swept up around his neck. He looked brightened and confident, like the captain of a yacht. He escorted Wilder into the studio. There were a few introductions and a tour of the set, but Wilder was not there long. He looked oldish but profoundly vital, full of a calm beneficent potency of spirit. Nobody beats the Wiz. “He never was from this place,” Seltzer said. Shortly after Wilder’s appearance, NBC canceled Eligible Dentist. Immediately, all of the equipment — computers and desks and fax machines and phones and the photocopier and everything else — was packed up and collected by the various rental companies from which they’d been procured. I hadn’t realized they were rented; I thought they belonged either to Kaufman Studios or NBC. I was informed that the urgency with which everything was returned was to protect it all from theft by the staff; otherwise, I was assured, that would undoubtedly happen: stealing rented supplies from canceled shows was apparently one of the tacitly acknowledged perks of the industry. Television was just beginning to become the ogre, where the head of the television studio dictated everything. I didn’t understand that the writer-creator, compared to the power of the network, was nobody. And I got on the phone [with NBC] with Gene in the room and I was saying the eff-word constantly. You’re effing this; don’t you effing tell me that…. 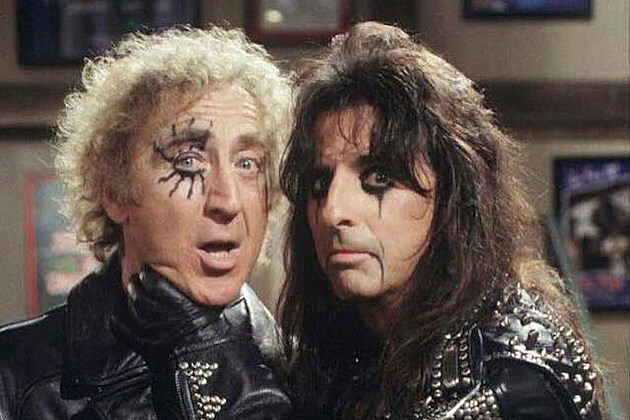 When we hung up, Gene was just shaken. He said, David, I think you said that word twenty-three times. I said, He deserved it. He totally disrespects what we’re doing. Well, I was fired shortly after, summarily. Was Noam Pitlik the director for this project?